You can display the weather in a couple of different ways by adding the weather widget into a zone. You can display the weather from the location set on the device or from a specific location. Then determine how many days weather you wish to show and what weather information is displayed. Select your designated zone and enter the zones playlist by double clicking on the zone, or click 'Edit Zone Playlist'. Click 'Widget' and select 'Weather' to insert the weather widget. As mentioned the widget can be configured to show the weather from either the location set on the device or from a specified location for a determined amount of days. Location type - Select 'Automatic' for weather related to the location set on the device. To show the weather from a specified location, select 'City' then enter the city. 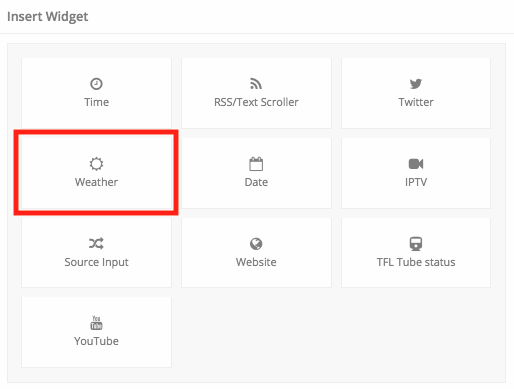 Once the widget has been configured you can customise what weather information is shown and how it is displayed. If you choose to show weather for multiple days your zone will be divided into that number of equal areas. The template is where you choose which weather information is shown. The majority of the options show just the temperature and a weather icon. 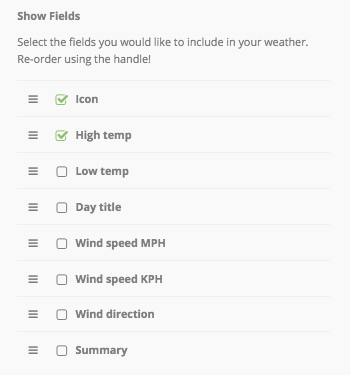 The 'Custom' option gives you the ability to select and show more weather information. To show a piece of information, simply select it from the fields available. When you click on a fields name a bordered box will appear which will hold the information that you can re-size and re-position. 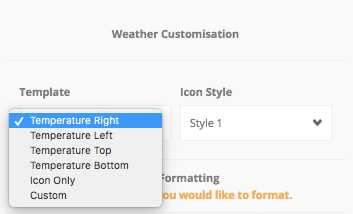 This option simply gives you the ability to choose the style of the weather icon, if you choose to show this. 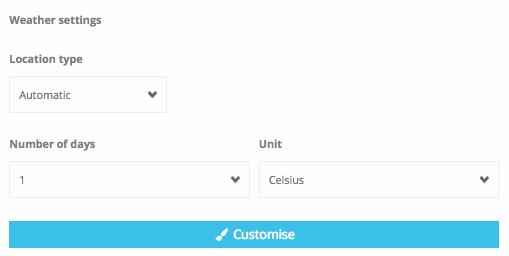 When you have configured the widget you can customise the formatting. 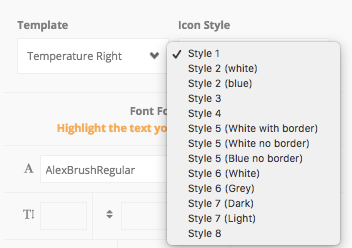 If you have multiple fields, select the field and use the formatting settings to customise its style.